We use OpenStreetMap, a free and open editable map of the world, to map areas where we work and for all mapping in the project. We also use software like QGIS, an open source GIS (geospatial information system) software to do further analysis and to produce specialty maps, and ARCGIS, a non-open source GIS software. We use Tile Mill and other MapBox products to make our maps prettier online. How it works: Our mappers are all young community members, residents of the places we work – primarily, the slums of Nairobi. They collect data with GPS devices, they work with computers to edit and upload the map information, and they are also learning to do more complex cartography and GIS. 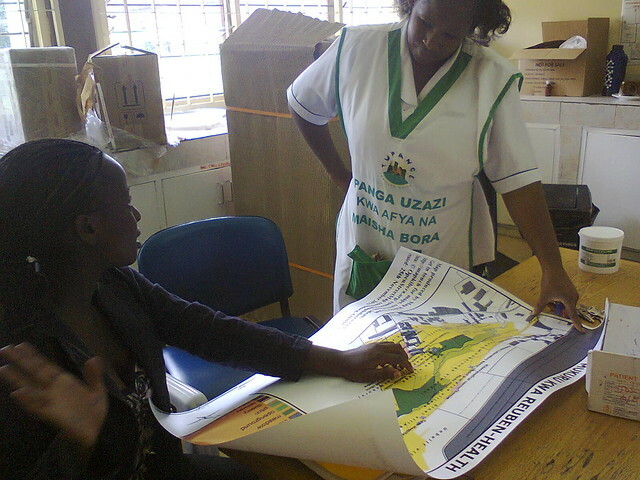 Mapping may include surveys of the general features of the slum or other community – like pathways, clinics, water points and markets – or might get into a great deal of detail in one subject – say, health mapping. In that case, surveying can include not just chemist locations but also hours of operation and kinds of services offered. We focus our maps on public information – we do not work (usually) with private data such as household information, because we want to publish and share as much as possible in the community. See Methods for more about how we work with maps to make a difference. 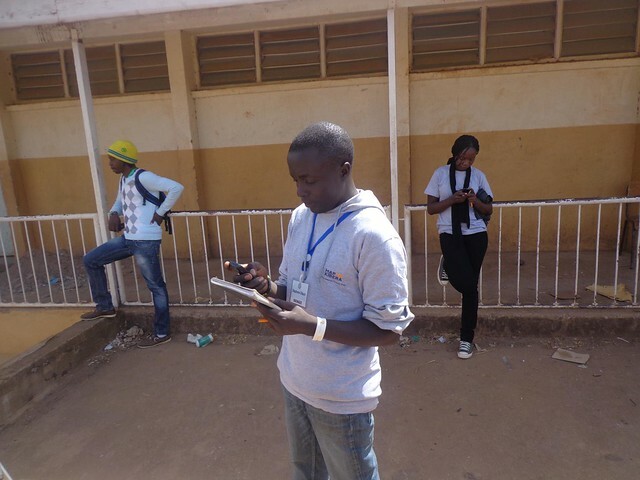 Map Kibera uses tools which we call “Voice” - because they are all about amplifying the voice of the community. Our programs currently use blogging with Wordpress and Ushahidi software to report on issues that affect the community. How it works: A team of reporters works in each slum, editing the sites and writing articles and reports as well as illustrating with photographs. The teams report about anything and everything that is of relevance to the community, including breaking news, critical issues, and lesser known local efforts and talents. We use SMS integration with our Ushahidi sites so that residents and our own reporters can text in news for our editorial team to review and post to the sites. During critical events we recruit volunteers to help submit reports and we invite anyone to send in an SMS to our number including the word Kibera or Mathare to indicate location. Video is a great way to get into detail and visually represent the kinds of important stories that happen in the slums and other communities. We started working with video in order to give more depth and also to reach bigger audiences. Map Kibera started out using Flip handheld video cameras, which we still use, but now we include other camera styles as well. The videos are meant to be seen online on Youtube, as well as through the Voice platforms, and in screenings locally around Nairobi. 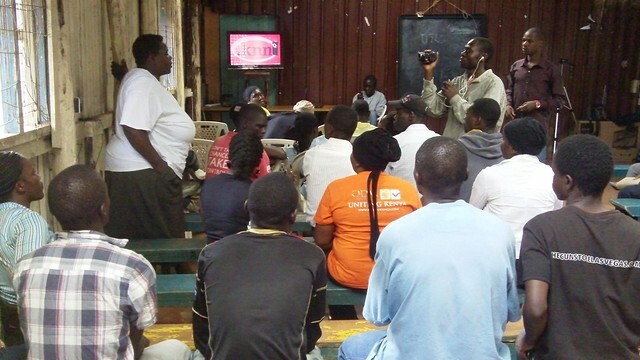 The focus is on local news and the “untold stories” of the Nairobi slums. How it works: Our videographers are, like everyone in our programs, youth from the slums and areas where we work. They shoot, edit, narrate, and conceptualize all the videos, so that the views you see are really the views of the community. Most videos include opinions and interviews with regular slum residents – not the kind of people usually seen on television. Video is a challenging medium to learn technically, and our members who work on videos are citizen reporters of the highest caliber – they represent the citizens, but they have learned technical skill on par with many professional journalists.